Udarakarshanasana (abdominal twist pose) is the important Pose during the Process of Shankha Prakshalana. It is the fifth Asana of stomach cleansing Process (Shankha Prakshalana). In stomach cleansing process Abdominal stretch pose is used for pressure making in your stomach. Apart from that, you can attempt Udarakarshanasana in your Yoga season. The abdominal twist pose is easy to perform but very effective for your abdominal. Perform Udarakarshanasana five to six times with other Asana. We are sure that, you’ll love this simple yet powerful Asana. Let start Udarakarshanasana by sitting in the position of squatting. Keep your feet along with hip wider. Place your hands on your knees. After that, breathe out twist form your right knee and keep them just close to your left foot. Place the inside part of your right foot on to the ground. Next step, with the help of your left hand (use your left hand as a lever), push your left knee towards the right (while you’re bending/twisting to the left). Now what you have to do is, shrink your lower abdomen (squeeze) along with look towards your left shoulder. Remain in the position around five to ten breaths. Next step, breathe in and come back to the sitting squatting Pose. With exhale imitate the same process to your other side of the body for complete 1 round. You have to practice this Pose for five to six rounds. If you are comfortable performing Udarakarshanasana. Then definitely you can easily perform Kakhpadasana. 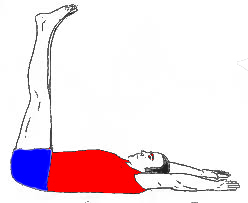 KakhPadasana is optionally used in Shankha Prakshalana. But basically, there are five Asana are used in the Process of stomach cleansing process. Udarakarshanasana generally stretches your knee joints, legs, ankles, and toes. It is a belief that, daily practice of abdominal stretch pose may prevent infections in the urinary tract. Also, reduces the symptoms of urinary retention. Udarakarshanasana uses stretching & compression to lower downs the abdominal problems. Basically, Udarakarshanasana did after consuming water or drinking water. It gives relieves in arthritic knees and lower down the pain in the knee. Relieves constipation and a gastric problem (particularly if performed after drinking warm water). People of all age groups can perform this Pose. Best for constipation and stomach related general diseases. Udarakarshanasana is quite a simple Asana. But avoid this pose in severe knee pain or in recent knee injuries. Be concentrate on your breathing throughout the process. If you are suffering from constipation drink lukewarm salty water 4-6 glass. After that perform Udarakarshanasana pose. This single Asana helps you a lot regarding stomach related issues. With Kapalbhati Pranayama practice this pose. This will definitely improve your digestion for better functioning. Perform all the yogic activities under the supervision of an expert person. Always use a Yoga mat for your practice, or you may use a folded blanket for comfort.